Built as a private residence by renowned cognac distillers – the Hennessy family in 1907, La Clef Champs-Élysées Paris is housed in a five-story Haussmannian-style building that has kept every bit of its character and charm over the century. 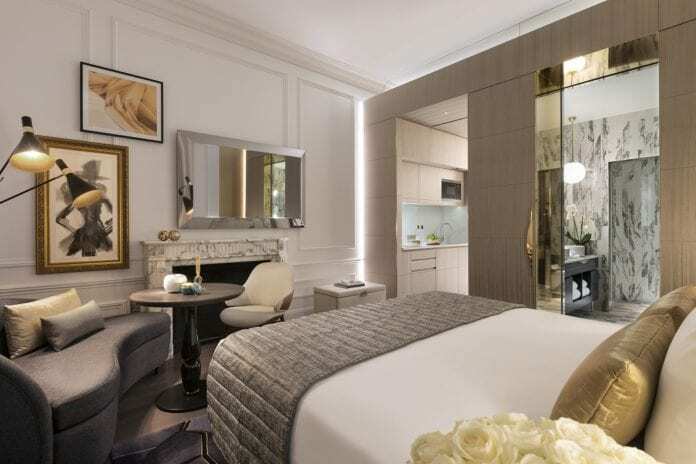 CapitaLand’s wholly-owned lodging business unit, The Ascott Limited (Ascott), has opened La Clef Champs-Élysées Paris in France, its third property under The Crest Collection – a prized selection of some of Ascott’s most prestigious and unique luxury serviced residences. Located in the heart of Paris’ most iconic 8th arrondissement, housed in a building steeped in history, the new La Clef Champs-Elysées Paris residence offers discerning travellers extraordinary experiences with a sense of home. The entrance to La Clef Champs-Élysées Paris is on Rue de Bassano, a few minutes from many of the French capital’s most sought-after attractions, including the Arc de Triomphe, Eiffel Tower, Grand Palais, Théâtre du Rond-Point and the famous Avenue des Champs-Elysées. The property is also a stone’s throw from Avenue Montaigne and Avenue Georges V with their luxury boutiques and fashion houses – the epitome of French glamour. The elegance of this finely preserved building stands out in its cornices, corbels, gilding, period molding and delicately chiseled ironwork.